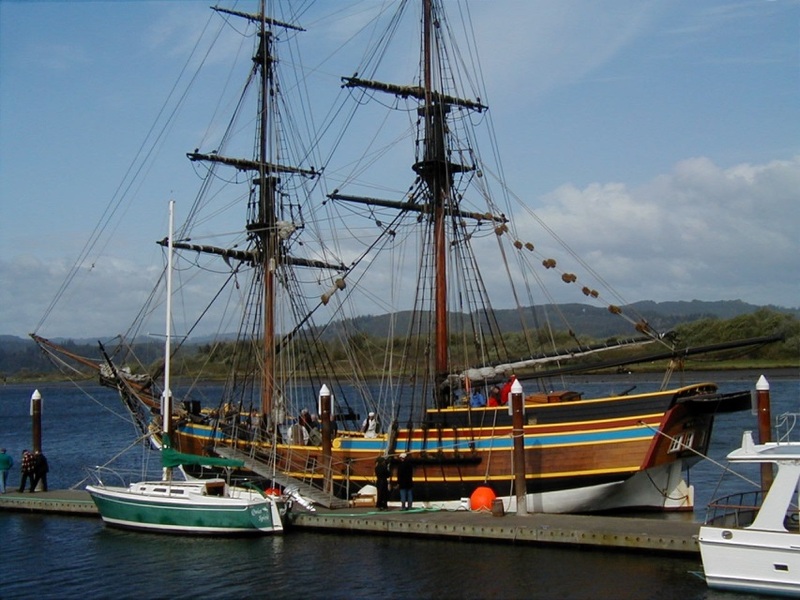 The City of Coos Bay was designated the Tall Ship Port of Oregon in 2014. Citizens celebrate the area’s maritime history with a festival when the Lady Washington and Hawaiian Chieftain arrive in port. The city dock becomes home for the tall ships for two weeks each May. The Festival of Sail includes food and craft vendors, a downtown treasure hunt, ship tours and sails, a pirate movie at the historic Egyptian Theatre, and a reconciliation ceremony with the Confederated Tribes and Coquille Tribe. Tom Leahy, Director of the Tall Ship Program, coordinates scheduling the tall ships for the annual Festival of Sail and organizes student sailing trips. The festivities include a BBQ dinner at the Boat Building Center for the ships’ crews. The Downtown Association partners with the center with planning and advertising of the event. 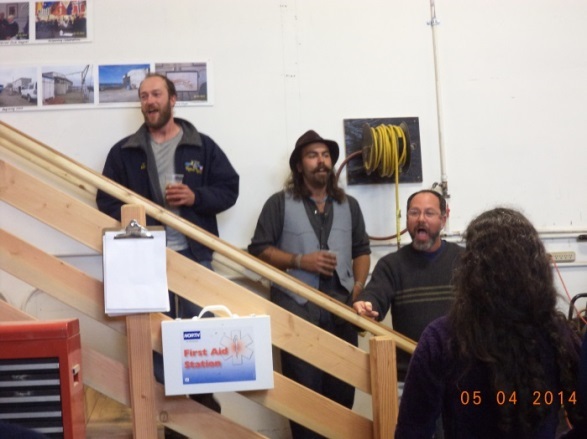 Picture at right: Crew members from the Lady Washington and Hawaiian Chieftain lead attendees in singing sea chanteys. A BBQ dinner was prepared by board members for the crew in May 2014. While in port, free tours of the tall ships are available to the public. Visitors not only experience a bit of history, but also have a look at life on board a sailing ship. Educational sails for elementary students are provided through scholarships. Mr. Leahy compiled a history of tall ship building and teaches a tall ships short course at Southwestern Oregon Community College. As part of the center’s outreach program, Board President Jim Berg has given a number of presentations on the area’s ship building history from the 1850s to the 1920s. Sunset Middle School received a 5’ unmanned sailboat for Mr. Giniger’s 7th grade students to assemble, decorate, name and track once it’s launched. The vessel is from NOAA the National Oceanic and Atmospheric Administration. The project provides students an opportunity to learn buoyancy, currents, mapping, design, and construction and is part of the STEM education model to teach students Science, Technology, Engineering, and Math. 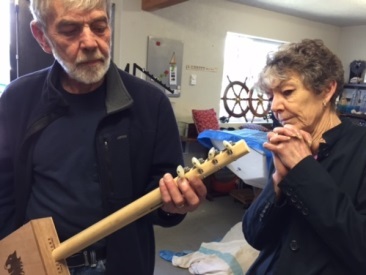 Coos Bay Boat Building Center board members Sarah Recken and Bob Sasanoff and member Pete Perrin assisted the students in assembling the vessel. The starting point began with students touring the CBBBC facilities and looking at a broad range of ongoing projects. The second phase introduced students to role models in the community that made their living in various maritime careers. CBBBC members helped the class assemble the vessel and set the small sail. Sunset students gathered at Empire Lake to watch the boat under sail. The next step in its journey is to get the boat aboard a NOAA ship, into the ocean and on its voyage. When the SS Dolphin (Sunset’s Mascot) is ready to sail, NOAA will set the boat on the equator, with its GPS sending signals for all of us to follow. Ideally the self-sailing boat will be found on the other side of the world, where the messages students composed will help communication and possibly send the SS Dolphin on for another trip. Picture at left: Pete Perrin and student Nick prepare to secure the bulkheads. After they have been secured and dried, the hull will be filled with rigid fiberglass to give the boat extra bouyancy. Once the deck is attached to the hull, students will place a small time capsule in the boat. Sunset School’s innovative educator Nick Krissie has the done a lot of work to prepare for the year’s last big math assignment. With the help of members from CBBBC, every 5th grade student started with 1” x 3’ dowel and a cigar box, ready to make a cigar box guitar. There were many measurements to be made to locate the dowels running through the cigar box, all the musical measures that depended on mathematical order, etc. Students made the connections from math class to real applications on their guitars. Errors often caused some sour notes but clearly made the case for learning and “loving” math. Mr. Krissie arranged with the world’s famous cigar box guitar performer to meet the students for a concert in May. In June the students were recognized for their achievement in the Coos Art Museum. Students from Alternative Youth Activities used the center for a classroom to learn woodworking skills, how to use wood working tools, and woodshop safety. Students used their new skills to construct projects. The center coordinates with Southwestern Oregon Community College to place business interns in learning situations. In 2013 Max Massengale worked with the center on improving their social media and website. As part of their community outreach program, the center sponsors Tall Ship Days/Festival of Sails in May and participates in the Empire Clamboree in June as part of their community outreach program.